Saab, Volvo need more than 'me-too' German luxury to win in U.S.
(Bloomberg) -- Volvo and Saab, which are struggling to revive slumping U.S. sales, need to find distinctive design and the right price tags to win sales from luxury brands such as BMW AG and Daimler AG's Mercedes-Benz, experts say. Succeeding in the U.S. luxury segment is essential to restoring profitability at Saab and Volvo after years of losses under General Motors Co. and Ford Motor Co. The U.S. is Volvo's largest market and was Saab's biggest until last year. Volvo's eight-month U.S. deliveries dropped 12 percent because offerings such as the S40 sedan failed to attract buyers, while Saab's plunged 86 percent as consumers waited for the new 9-5, the carmaker's first new model in eight years. BMW and Mercedes both posted gains. As the new owners of the Swedish brands begin planning new models, which take years to build, they're counting on their offerings at the Paris auto show opening next week to help bring back some of the buzz. Volvo will premiere its new V60 station wagon, while Saab will showcase a prototype of its first electric car. A test fleet of the Saab 9-3 ePower, an all-electric version of the 9-3 SportCombi, will begin user trials in Sweden next year. The Swedish carmakers will need to lure back customers who fled in the last year as GM and Ford sought to offload them. Ford sold Volvo to Zhejiang Geely Holding Group Co. last month for $1.5 billion, while Spyker Cars NV purchased Saab from GM in February for $74 million in cash and $326 million in shares. Saab's U.S. sales, which peaked at 48,000 cars in 2003, dropped to 8,500 last year. 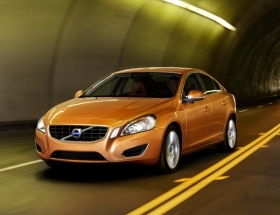 Volvo's U.S. deliveries declined 16 percent to 61,435 in 2009. BMW sold 196,502 cars in the U.S. last year, while Mercedes delivered 190,604. Toyota Motor Corp.'s Lexus is the luxury leader in the U.S., the world's second-largest car market after China. The fight back will be toughest for Saab, which was on the brink of collapse before Spyker stepped in. While Volvo is now backed by a Chinese company with money to invest, Spyker has never turned a profit and is smaller than Saab, which is surviving on loans from the European Union's investment bank. 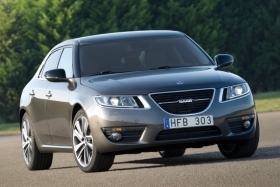 Saab's 9-5, released in the U.S. last month, competes with Audi AG's A6, BMW's 5 series and Mercedes's E class. The release follows the full restart of Saab's factory in Trollhattan after a seven-week shutdown earlier this year under GM. Saab is pricing the 9-5 in the United States in the luxury segment, with the Aero version of the car starting at $47,565, according to the manufacturer's Web site. The BMW 5 series begins at $44,550 and Audi's A6 at $45,200. Saab's strategy will be difficult to implement, said analyst Michelle Krebs. Volvo expects the S60 to become its best-selling U.S. model after it debuts later this year. Volvo CEO Stefan Jacoby, who took over this month after leading Volkswagen AG's U.S. operations, says he intends to bring the automaker into the “top league of the premium manufacturers.” To do that, Volvo will no longer be able to rely alone on its reputation for safety. “That intangible has lower and lower value each day,” said Michael Robinet, an IHS Automotive analyst in Northville, Michigan, explaining that nowadays most cars sold in the U.S. win the government's top safety ranking. Both brands need better design to succeed in the U.S., said Jim Hall, principal of 2953 Analytics Inc. in Birmingham, Michigan. The Swedish carmakers in recent years crafted cars that were too bland or confused buyers, he said. Volvo's new S60, a retooled version of the mid-sized sedan that first came out in 2000, will start selling in the U.S. at the end of the year, said Gerry Keaney, Volvo's sales and marketing chief. The car, which comes with an optional system to automatically stop the vehicle at low speeds if someone walks in front of it, starts at $37,700. The S60 should be able to overtake the XC60 as Gothenburg-based Volvo's best-selling U.S. model, Keaney said. The first challenge will be letting American consumers know the carmakers survived.